Interesting Facts - Served 4 double faults in a row on national television, centre court Hobart in Australian Hardcourt titles! (only break of serve 3rd set against Alan Stone). Biggest Achievement - Final of Queensland Open, NSW Hardcourt Open, took a set off Arthur Ashe at Wimbledon, the year after he won the Championships. (Back in the Dinosaur era). Sherry grew up in Taiwan and moved to the United States with her family at the age of 17. She went back to Taiwan after university and that’s when she first had a private lesson in tennis, Tim Wang was her tennis coach and later became her husband. They moved to Australia together in 2009 and Sherry discovered an interest in Sport Management. She joined TOTAL TENNIS as a Sport Manager in early 2014 and finished her degree in Sport Management at Deakin University. She aims to use her professional understanding of sports management to produce a dynamic and fulfilling experience for the staff and clients of TOTAL TENNIS. Interesting Facts - The bottom layer of my shoe flew out in a middle of a match in Malaysia. Gear - Wide brimmed hat, long sleeve shirt and sun screen for protection from sun. Prince racquet. Favourite Player - Rod Laver. If you haven't read his book, Rod Laver: A Memoir, do yourself a favour and get a copy. The story of a true champion and a very humble gentleman. Favourite Grand Slam Event - Wimbledon. If you are ever in London, take a trip out to Wimbledon. If the tournament is not on, make sure you see the Wimbledon Museum, then you will understand the history of our great game. Interesting Facts - When playing Ken Rosewall in a televised match on Centre Court during the NSW Open, I had the chance for a win of a life time. At one set all, with Rosewall serving at 0-1, 0-40, I started reading the headlines of the next day's sports pages of my victory. I lost that game and the set, 6-1. I did get a little revenge when fellow Victorian Simon Clarke and I defeated Rosewall and Davis Cup player Phil Dent in the doubles. Biggest Achivement - Helping hundreds of young (and older) players on their path to improve and enjoy their tennis. Born in Belfast, Northern Ireland, Jonny grew up playing the game at his local club St Patrick's Racquets at the age of 8 years old. Jonny enjoys coaching junior players as well as beginners of all age groups that are aiming to become serious players. He aims to make sessions fun, energetic and challenging, coaching anyone wanting to take their game to the next level. Gear - Racquet: Tecnifibre T-Fight 305 Strings: Tecnifibre Razor Code 17g 50lbs. Interesting Facts - Won an Andy Murray signed Head tennis racquet on a Morning TV Program. Biggest Achivement - Represented Belfast against Dublin. Belfast & District Senior League Duff Cup Winner 2011. Ulster Doubles Champion. Trained at King of Kings Tennis Academy in Florida. Interesting Facts - Born and grew up in Wimbledon only few hundred metres from All England Lawn Tennis Club. Started playing this beautiful game at the age of 10. First coach was an inspiration and became a lifelong friend. Played tennis competitively, locally and internationally in many countries including; the US, Canada, France and Italy. Has been coaching for over 25 years locally as well as internationally and has a deep interest in the inner game of tennis (mindfulness approach) and how the mental side affects the outer game(the way one plays). Other interests are; yoga, travel, sport and music. Favourite Player - Roger Federer - for his natural ability to make it look easy. Djokovic for athleticism and adaptability, especially against Fed and Nadal. Favourite Grand Slam Event - all are interesting, probably Wimbledon for the green grass. Interesting Facts - there is much more to playing tennis, than just the scoreline. Biggest Achivement -being able to recognise when mind wanders off in a match and then refocus attention on the task at hand......to play my game. Biggest Achivement - Winning all 3 events entered at the Yarrawonga Lawn Tennis Annual Easter Tournament. Chihiro grew up playing the game at TOTAL TENNIS. He played pro tour events in Spain, India and Australia. He trained at Sanchez-Casal Academy which is high performance trainning centre that combines tennis and education for its players for 2 years. 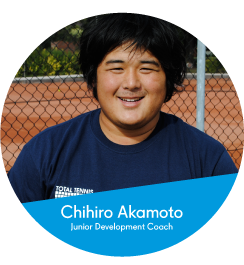 Chihiro`s key training specialities include high volume of ball hitting coupled with high intensity, high noise and all-round high energy coaching! Biggest Achivement - Won Australian Money Tournament. ( AMT) Ranked 300+ in Australia. 1 year pro tour to Barcelona and India.